Mozina takes us farther than we meant to go—to the edge of the Arctic Ocean, to Elvis's bedroom, to the terrible confusion at the heart of every human relationship. I love this collection. In a wide range of forms and tones, the fifteen stories in Andy Mozina’s new collection, Quality Snacks, center on high-stakes performances by characters trying to gratify both deep and superficial needs, often with unexpected consequences. Driven by strange ambitions, bungled love, and a taste for—or abject fear of—physical danger, the collection’s characters enact the paradox in the concept of a quality snack: the dream of transmuting the mundane into something extraordinary. Two teenage boys play chicken on a Milwaukee freeway. A man experiencing a career crisis watches a seventy-four-year-old great grandmother perform an aerial acrobatics routine at the top of a swaying 110-foot pole. Desperate to find a full-time job, a pizza delivery man is fooled into a humiliating sexual demonstration by a couple at a Midway Motor Lodge. A troubled young man tries to end his father’s verbal harassment by successfully hunting a polar bear. After an elf civil war destroys his Christmas operation, Santa Claus reinvents himself as a one-man baseball team and ends up desperate to win a single game. And in the title story, a flavor engineer at Frito-Lay tries to win his boss’s heart with a new strategy for Doritos that aims to reposition the brand from snack food to main course. 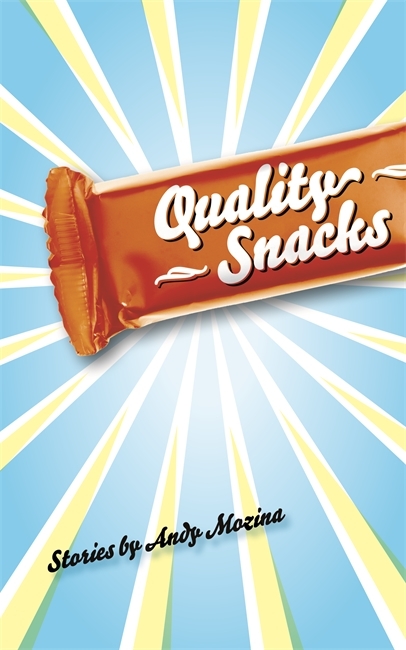 While some stories embrace pathos and some are humorous and some are realistic and some contain surreal elements, all of the stories in Quality Snacks share striking insight and a cast of compelling, well-conceived characters. This collection, in an earlier form, has been a finalist for the Flannery O’Connor Short Fiction Award, the Dzanc Short Story Collection Contest, the Elixir Press Fiction Award, and the Autumn House Fiction Contest, and a semi-finalist for the Mary McCarthy Prize. Readers of fiction will be satisfied by the variety of fare offered by Quality Snacks. Andy Mozina is the author of the story collection The Women Were Leaving the Men (Wayne State University Press, 2007) which won the Great Lakes Colleges Association New Writers Award. His fiction has appeared in numerous magazines, including Tin House, Ecotone, Fence, The Southern Review, and The Missouri Review, and has received special citations in Best American Short Stories, Pushcart Prize, and New Stories from the Midwest. Mozina is professor of English at Kalamazoo College. This collection of 15 unusually well-crafted pieces of short fiction will be savored in its variety of elements – point of view, voice, humor – and Mozina's instinct for the apt phrase. Characters are memorable and touching by their thoughts and actions as well as by their humanity. . . These stories, largely set in the Midwest, will appeal to. . . anyone who appreciates good writing. Mr. Mozina's work is first rate and fans of Carver, Saunders and a certain kind of Marquez-esque fabulist literature will find much to like in this collection. Women Were Leaving the Men (2007) and Quality Snacks (2014), both published by Wayne State University Press. Andy Mozina’s dark comic midwestern genius thrills and troubles me, and I want more of it. Each of these stories is a philosophical puzzle, and each is a strange adventure to the foreign land that is another person's mind. Through his plainspoken narrators, Mozina takes us farther than we meant to go—to the edge of the Arctic Ocean, to Elvis's bedroom, to the terrible confusion at the heart of every human relationship. I love this collection. Andy Mozina is a magician. I can’t think of a species of masculine folly—whether guilty rebellion, or panicky narcissism, or dependency disguised as tyranny, or anomie passing as glib enthusiasm for new lines of an employer’s tortilla chips—whose vocabulary and broken inner self Andy Mozina has not deftly conjured up for this collection. And he is as funny as he is wise. Andy Mozina's Quality Snacks is a collection of sad Rust Belt love songs. He maps a territory of dispirited office workers and aging small town beauties, all of them already beaten, always on the verge of worse. Echoes of Vonnegut, Borges, Cheever, and Saunders converge in these strip mall parking lots, in these dimly lit motels. Mozina asserts himself here as the fabulist poet of the Great Lakes working stiff. all, as these stories show, things could always get worse. It’s a powerful effect, to wedge the sad into the funny, the strange into the normal in order to split a character (or world) apart, and it’s one that I’m fond of. The oddness and commitment to the internal logic of these stories cements it: Mozina’s creating his own worlds, in the same circles, maybe, as George Saunders’ or Brock Clarke’s, but distinctly his own.